Triskaidekaphobics are known to avoid embarking on any journey when the 13th falls on a Friday. 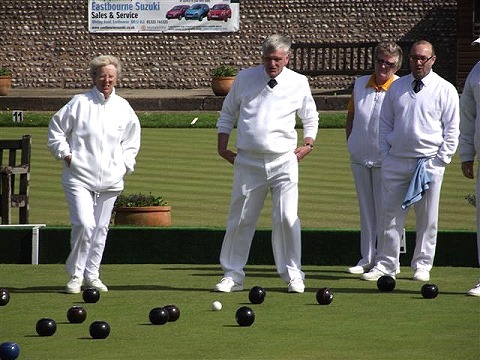 Fortunately they were not in evidence on Friday June 13th when the “big green coach” arrived at Highworth Bowls Cub ready to depart on our annual bowls tour. 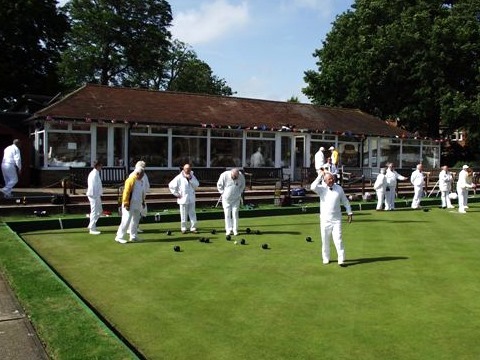 Given that recent tours have experienced the rain of North Devon and Tenby not to mention the European Monsoon and floods of Eastbourne it was a pleasant surprise to find that for us a weekend including Friday 13th promised and delivered warm, sunny and dry bowling weather throughout. Again as in recent years there were some “first timers” which shows that the popularity of the tour continues to grow which bears testimony to its reputation of being a great weekend so well organised by Josie and Frank Etherington. We set off in good spirits and made a stop at Shaftesbury for coffee and comfort. Shaftesbury was interesting and is well worth a visit with some good traditional shops and cafes. Amongst the shops one encounters a large Hovis loaf at the side of the road. Nearby through a cobbled passage a familiar view opens up made famous in the 1980s by the memorable advertisement for Hovis where the delivery boy pushes his bicycle with loaves in the front carrier up the hill then free wheels the empty bicycle down “Hovis Hill” aka Gold Hill (its actual name). I suspect “Health and Safety” would not allow this advertisement to be made today! 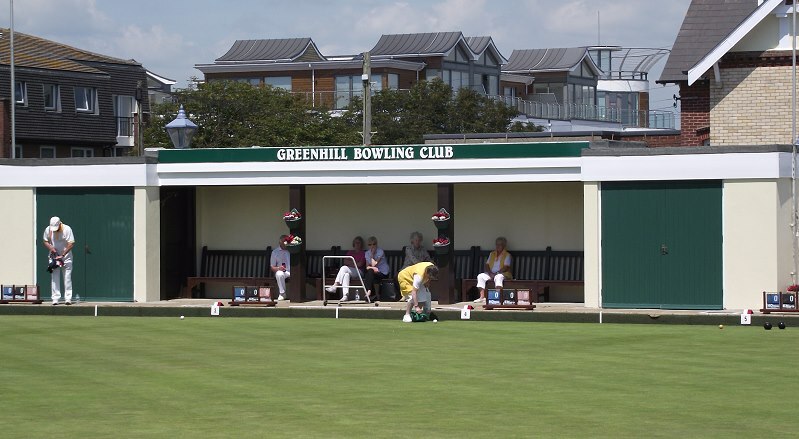 Suitably refreshed we continued our journey to Weymouth arriving at our base The Crown Hotel situated by the Harbour in time to grab a quick sandwich before heading to Green Hill BC Weymouth for our first match which was played in hot sunshine. 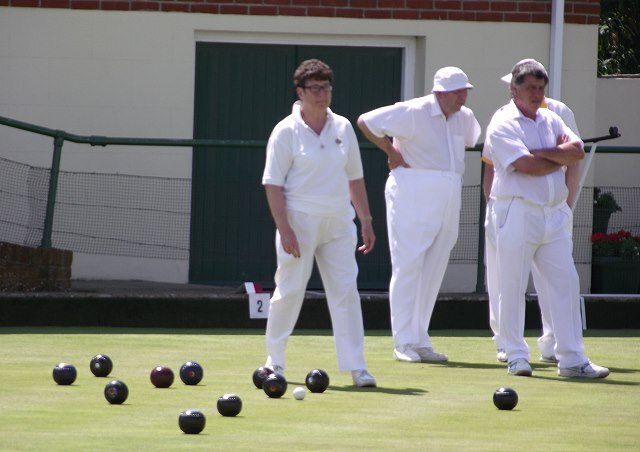 Due to the weather conditions the green was very dry and it was like bowling on polished glass. 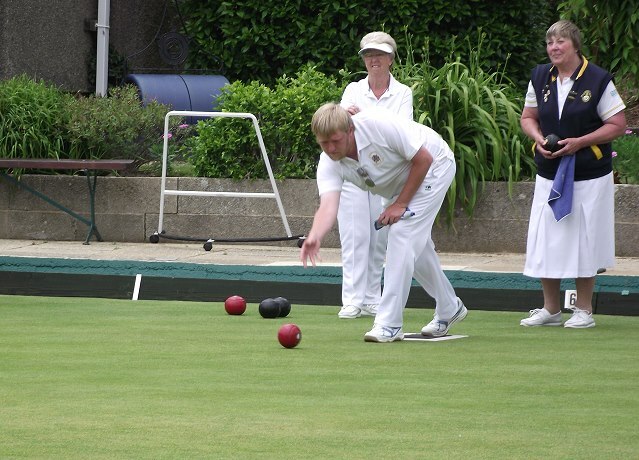 Consequently Highworth took a while to adapt allowing Weymouth to set up a strong lead before the tea and biscuits break. Afterwards we started to peg them back but never managed to catch them so our tour unfortunately started with a defeat. Sunburned and hot we returned to The Crown for a refreshing shower ready for our evening meal. The hotel proved to be clean and comfortable ideally situated near to shops, beach and harbour where the regular raising of the swing bridge was a spectacle of interest. The menu was traditional with a good choice each day although given their proximity to the harbour and fish perhaps making more use of locally sourced produce could have proved to be a good selling point given today’s consciousness with regard to food miles. Every evening there was entertainment in the form of various vocalists and also dancing so a wide range of tastes were catered for. The one detraction which affected certain rooms was the Bar/Night Club opposite which meant music and noisy users made sleep very difficult before the early hours for some of us. Saturday again dawned sunny and hot. After a free morning to explore we set off for our match at Portland Borstal. A spectacular climb up Portland Bill took us to the highest point where the Borstal was situated. 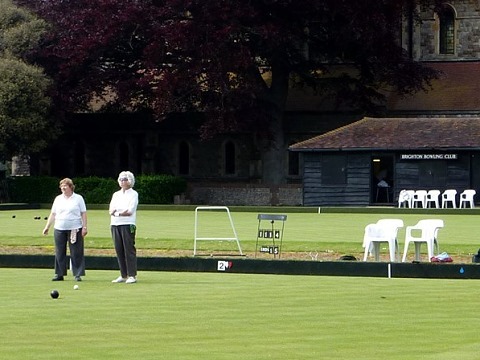 The Bowls Club was situated in the Governor’s Garden and involved a pleasant stroll through it to reach the green (it was fortunate most of us had bowls trolleys!). The Borstal Officers who were our opponents proved to be very friendly and had retired so our chances of being detained should we steal a victory receded. A wall down one side of the green produced an optical illusion making the green appear to have a slope from end to end but we were assured the green was level and once we overcame this found we were able bowl well. After a close contest Highworth emerged victorious. 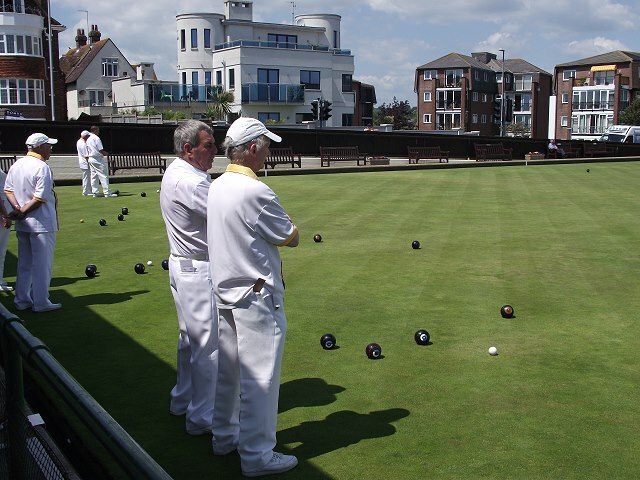 We were invited back to the Officers Club for “après bowls” and found it had spectacular views down the coast to the Isle of Wight from its balcony – quite stunning. Sunday again brought identical weather and an earlier start was made for Lyme Regis so the morning could be spent there. The ultra narrow streets produced a small problem for Danny our driver when we met a Double Decker bus where the width of the road was such that for both to pass was impossible. After some reversing and manoeuvring (difficult as other traffic was behind both buses) it was just possible to ease past with inches to spare. For his skill Danny received a round of applause from his passengers. Lyme Regis itself is a traditional quaint resort with useful shops and cafes. The cliffside gardens are also very pleasant affording excellent views along the coast and over the town and beaches. On such a hot day the shady trees and the breeze off the sea was pleasant and refreshing. 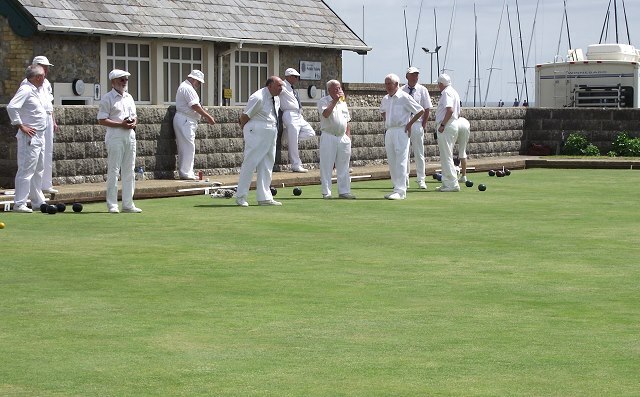 Lyme Regis Bowls Club (LRBC) is situated next to The Cobb (walled harbour) made famous in the film The French Lieutenant’s Woman where Meryl Streep with cloak blowing in the gale lashed by rain and waves stands on the wall of The Cobb in her iconic scene . This is at the bottom of a very long steep hill; the Coach Park is situated at the top of the same hill, the road between unsuitable for large vehicles. 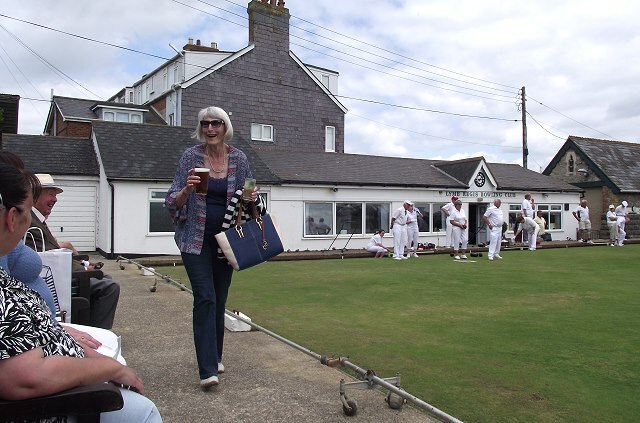 Fortunately the LRBC members must be well used to this problem and had kindly driven their cars up to meet our coach to transport the bowls bags down and after the match returned them to the top plus the Highworth bowlers for which we were very grateful. 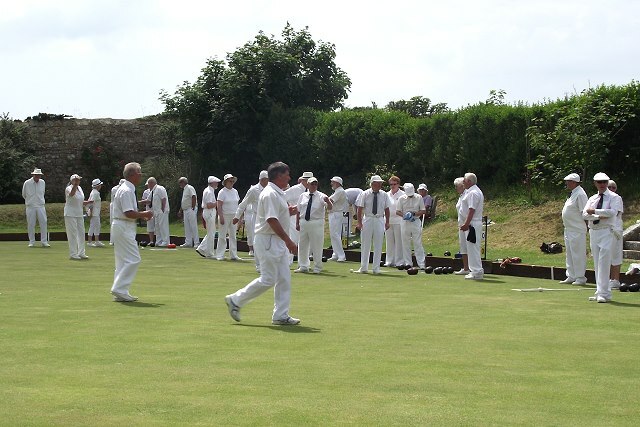 The match itself was again played on a very fast green and pre-tea Highworth were leading. 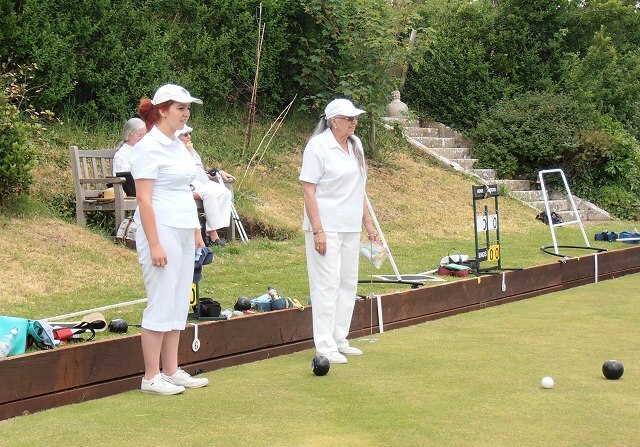 LRBC had been playing with two triples instead of rinks as two of their members were absent. 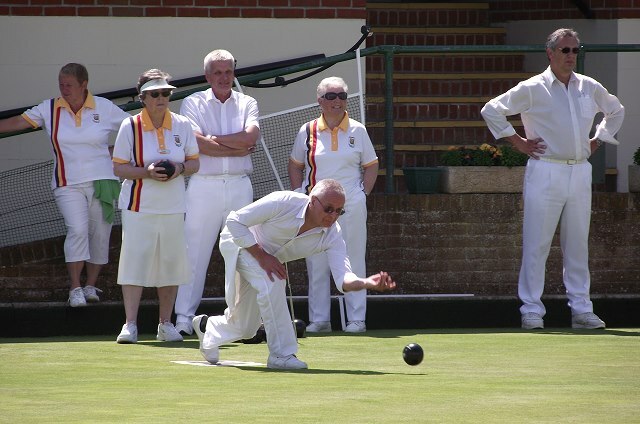 At this juncture two of our bowlers were persuaded to fill in so Jack Clarke and John White became honorary LRBC members for the rest of the match and turned LRBC fortunes round to such an extent Highworth narrowly lost. I understand both have been offered honorary life membership of LRBC! 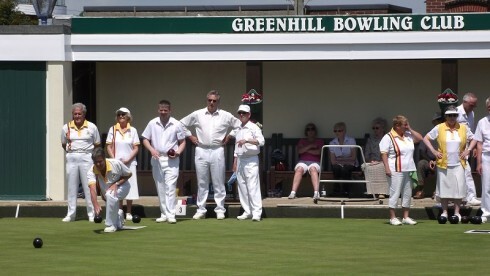 On Monday we returned home via Yeovil where we were due to play our final match. Yeovil town was rather nondescript the town centre looking like any number of similar country towns where the same chain stores and charity shops are now prevalent and lacked individuality. 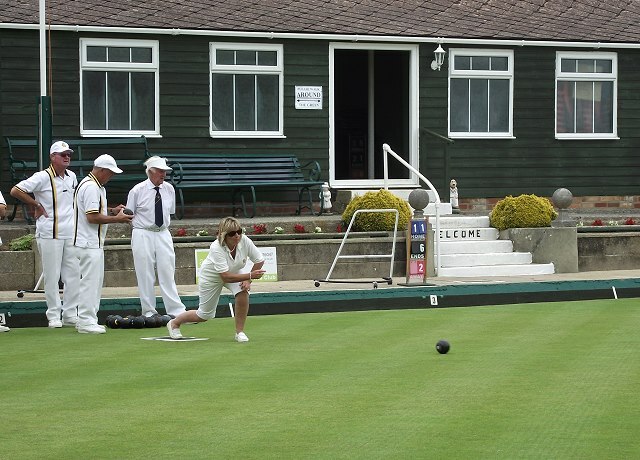 Yeovil Bowls Club was very plush with Squash Courts and Indoor Rinks. Their Trophy Room was equally impressive and their quality was later born out on the green as our team for that day were totally outclassed suffering a heavy defeat. 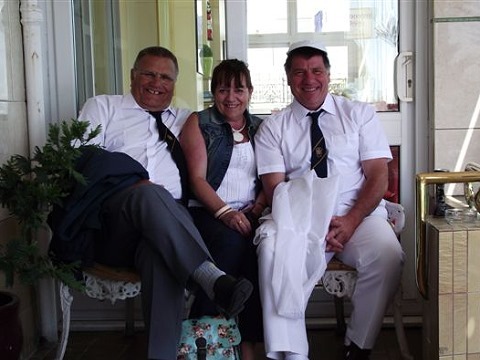 Although not a successful tour on the green it was a superb weekend for weather and the enjoyment of all was tangible. On behalf of all who participated I extend our grateful thanks to Frank and Josie for another fantastic tour meticulously organised. Friday June 8th 7 30 am: driving rain and blowing a gale as we assembled at HBC for the journey to Eastbourne. The prospects were not good. The forecast from the Met Office was dire for the weekend with Saturday likely to be the only day when the weather might improve. As we journeyed towards Sussex the rain and wind continued. A five second glimpse of a watery sun near Gatwick raised a muted optimistic cheer but a few miles later at the services the rain had resumed as we made a short stop. The journey continued under thick grey cloud, then miraculously six miles from Eastbourne it thinned and cleared to blue sky and sunshine. We soon arrived at the Albany Lions Hotel right on the seafront still in sunshine but the gale had not abated, if anything it had increased. 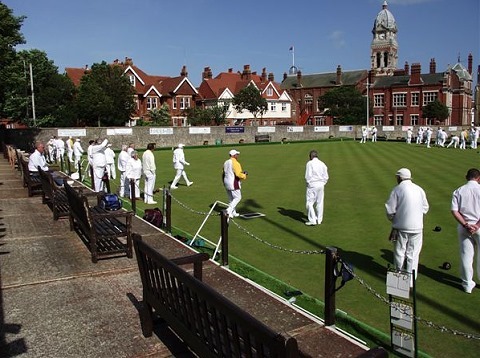 We dispersed to obtain a light lunch as breakfast by now was a distant memory, and returned to the hotel for 1 pm for the very short journey in the Team Bus to Eastbourne Bowls Club for our first match. 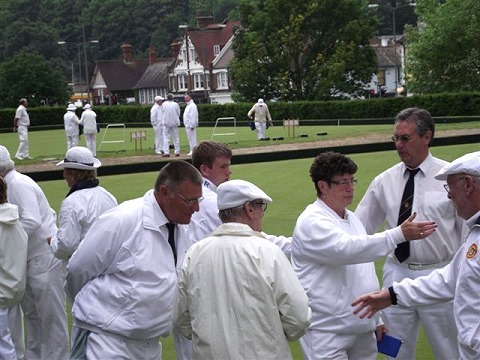 We were welcomed by the Eastbourne bowlers who proved to be very friendly but also competitive. 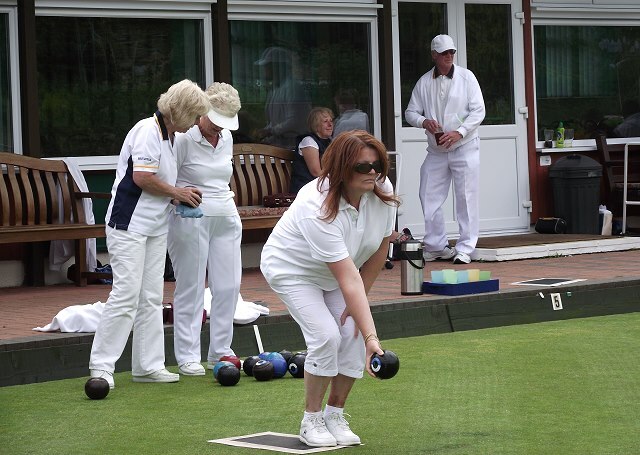 It was a lovely sunny afternoon but the wind became even stronger which presented a real challenge as the frequent gusts were strong enough to actually blow bowlers off the mat as they delivered their woods. 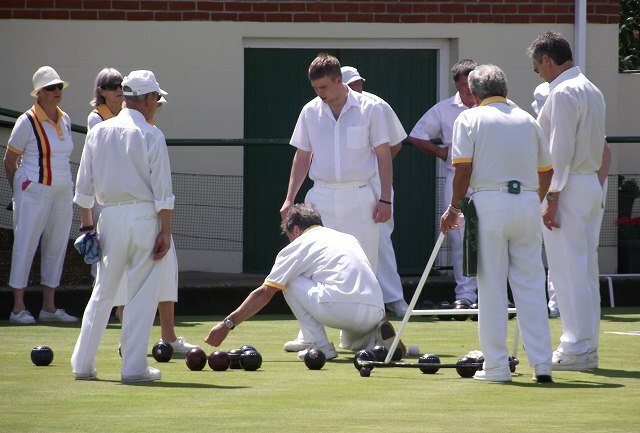 The green itself soon dried and bowled well. Getting the weight however was difficult as the wind either held up or accelerated the wood and when it swirled across the green it either accentuated or straightened the bias. Highworth coped better with the adverse conditions however and were comfortable winners. We returned to our base where an excellent dinner awaited us with some evening entertainment to follow at the hotel. Saturday dawned dry and sunny and although the wind had eased a little it was still blowing a gale. 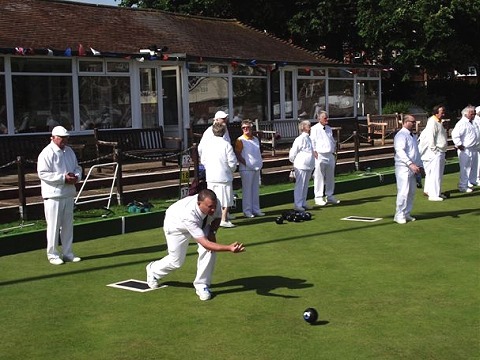 After a superb hearty breakfast we left for the match at Peacehaven and Telscombe Bowls Club which was tucked away but was eventually found. 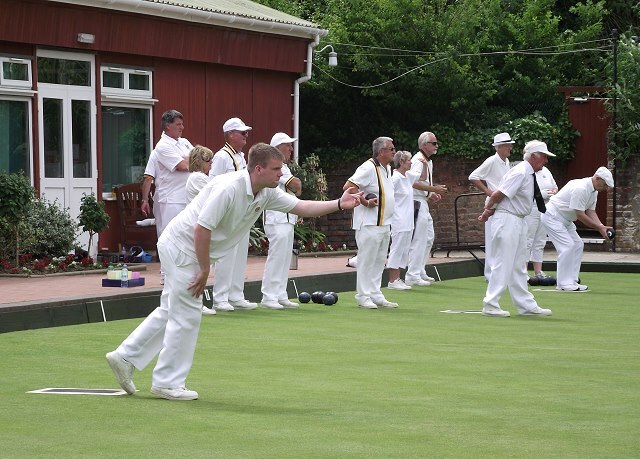 Again we received a very warm welcome from their members and the match got underway. 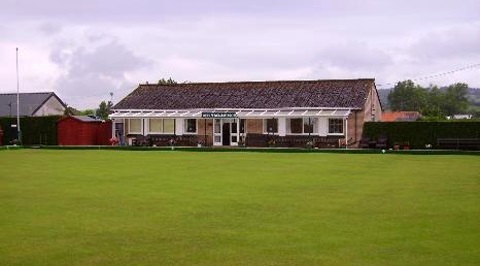 The green again bowled well and the wind was less of a challenge, Highworth again recording a decisive victory. The hotel once more provided a super meal. 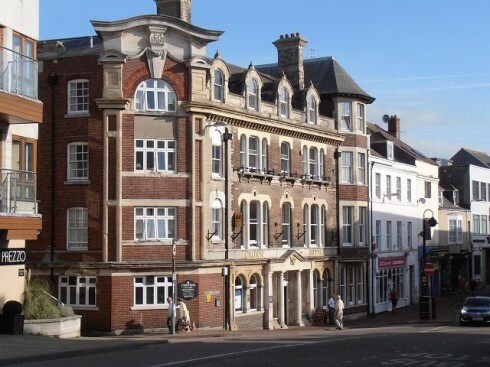 The food at the Albany Lions was really first class and although the evening meal was a carvery there was a good choice each day and other options such as an excellent steak pie and fish on various nights. The breakfast was particularly good with a wide choice and as much or as little as each person wanted. By that evening the weather was starting to deteriorate and it clouded over with rain by nightfall. Sunday morning arrived dull cloudy and damp. The rain was light by the time we left for Brighton but continued to threaten. The coach left earlier for Brighton so as to enable members of the party to indulge in Retail Therapy if that was their pleasure at a nearby shopping arcade where they could find shelter from the light rain which had started to fall and the chilly breeze. Those for whom this activity was not favoured found shelter in various coffee shops and other refreshment premises. There was also an excellent museum down on the esplanade free admission and chairs to sit on which also provided shelter. This was a very interesting place with various exhibits relating to the Brighton fishing industry which is not an activity which most people would associate with this place. Until the mid 19th century fishing was the main occupation and Brighton was just a fishing community. With the arrival of the railways it became a popular venue for day trippers and holidaymakers and the fishing boats gradually became pleasure boats as the town and the holiday trade expanded. There were three videos showing archive films recording this history which lasted long enough to pass the time until the bus was due to leave. 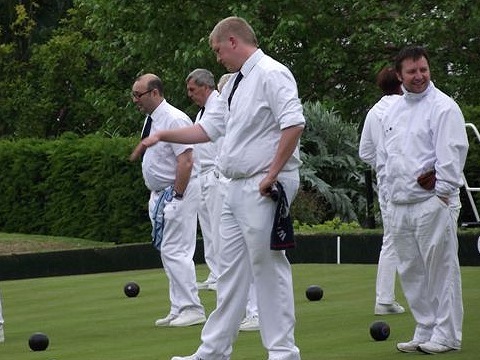 It was raining slightly on arrival at Brighton Bowls Club but the decision was made to start the match which could be shortened if the forecast for heavier rain proved correct. 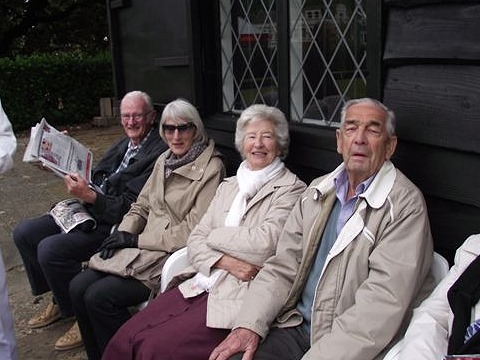 Soon after the start the rain became heavier and it was decided to play ten ends and stop for a small cream tea. During this break it was decided to conclude the match, but soon after this was announced the rain stopped and it was decided to continue. After a couple more ends the heavy rain returned but undaunted we carried on and Highworth secured another victory to complete a hat trick. During another excellent evening meal the European Monsoon broke over Eastbourne. 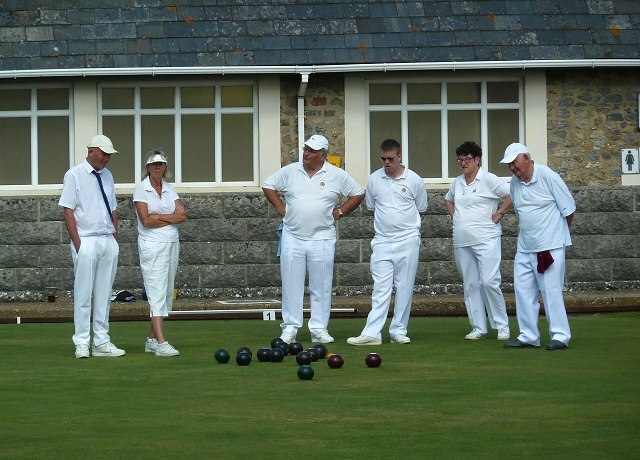 All through that night torrential rain and wind battered the hotel so it was no surprise to receive a phone call from Arundel Bowls Club before breakfast to say that their green was under water so our final match could not take place. It was decided to return home early stopping at Arundel on the way for a refreshment break. By now the rain had eased at Eastbourne but as we travelled west along the coast road inky black clouds could be seen ahead. At Arundel it was pouring with rain and parts of some roads in the town were flooded, it was very dark and the deluge continued unabated. 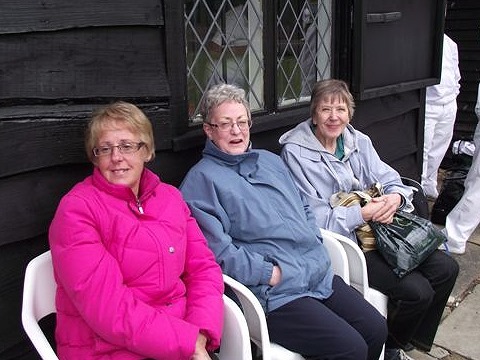 Those who braved the rain were able to get some refreshment and returned to the bus somewhat drenched. Soon after leaving Arundel we ground to a halt in what was later discovered to be a 12 mile jam due to the floods ahead. To the left and at a slightly lower level than the road were a number of caravan and camp sites where cars, caravans and tents were standing in extensive floodwater and the torrential rain continued. Danny our driver eventually managed to extricate us from this jam and we diverted through Chichester. Here we also encountered floodwater across the road and at various other locations as we headed towards home using a circuitous route across country through the heavy rain arriving back at Highworth Bowls Club just after 4 pm. 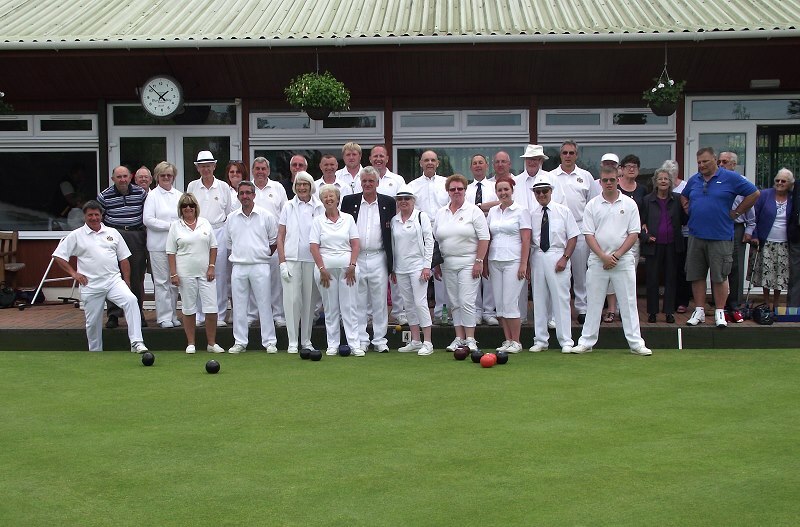 Despite the weather everyone had enjoyed another very successful Bowls Tour and were already looking forward to next year. On behalf of all participants I extend our grateful thanks to Frank and Josie Etherington for organising everything on our behalf which involves much hard work and dedication. 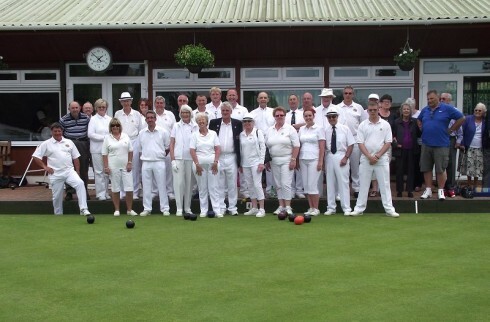 To many members the Bowls Tour is the highlight of their season and the organisation is second to none. 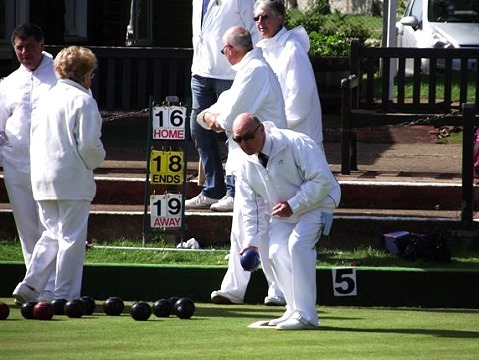 Frank and Josie are meticulous in ensuring that everyone has a great time and bowlers and non bowlers alike are catered for. Thanks also to David Bailey and Associates (Brian and friends) for the photographs attached to this report. 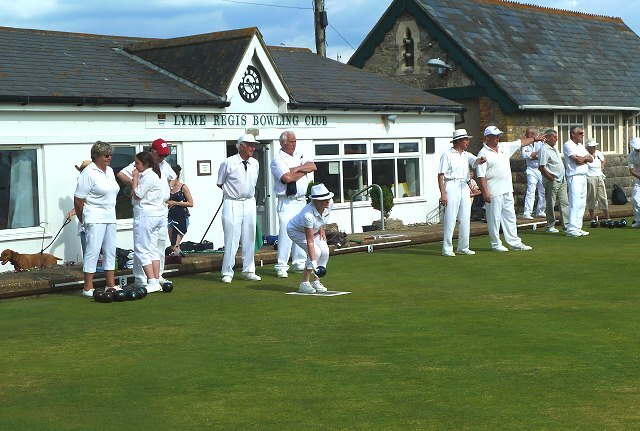 On Friday 17th June a Barnes coach full of bowlers and supporters left Highworth Bowls Club en route to Ilfracombe, North Devon. The rain started on the M5 in Somerset, and by the time the coach crossed the Devon border it was raining heavily. 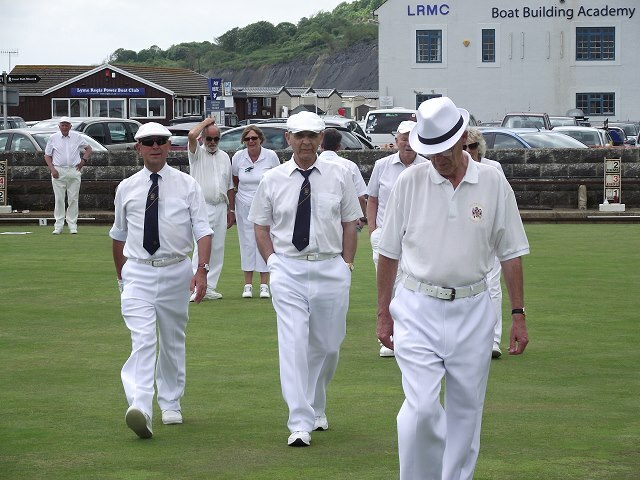 We arrived in Ilfracombe just after midday and undaunted changed into Bowling Gear in readiness for our match at Ilfracombe Bowling Club that afternoon. 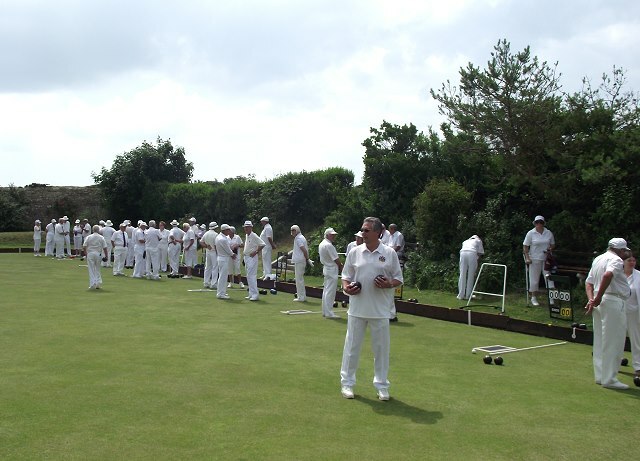 The rain had eased for our arrival at the club where we were warmly welcomed by the Ilfracombe members. 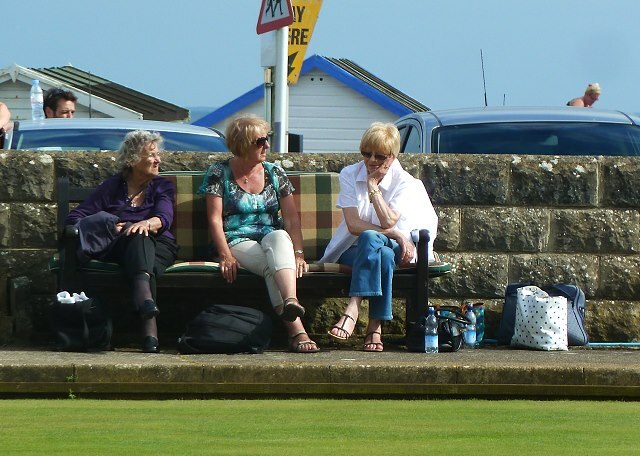 The match started and by the 10th end when we stopped for tea and biscuits conditions were not too bad. Soon after the restart the rain set in heavier again but we carried on with resolve and Highworth emerged wet but victorious at the end of the day. We then returned to our hotel to a well earned evening meal. Saturday morning dawned cloudy and very heavy prolonged showers soon broke out. After a hearty breakfast we were taken by coach to Lynton and Lynmouth for a couple of hours sightseeing prior to our match with Combe Martin Bowling Club that afternoon. Our driver took us along the narrow coast road so we could see the spectacular coastal views, this involved negotiating some hairy hairpin bends with sheer drops on one side and there were times when the passengers were unusually quiet! Lynton and Lynmouth are very pretty villages connected by a Cliff Railway and are well worth a visit. The church in Lynton was very interesting with some wonderful stained glass windows and an ideal refuge from the very heavy showers. It also contained a poignant memorial to the victims of the Lynmouth Flood Disaster. This devastating tragedy affected the lives of so many villagers and the ages of the victims, from an 8 month old baby to a lady in her 80s, and the fact that whole families lost their lives, really brought home how lucky we are to live on the hill of Highworth. 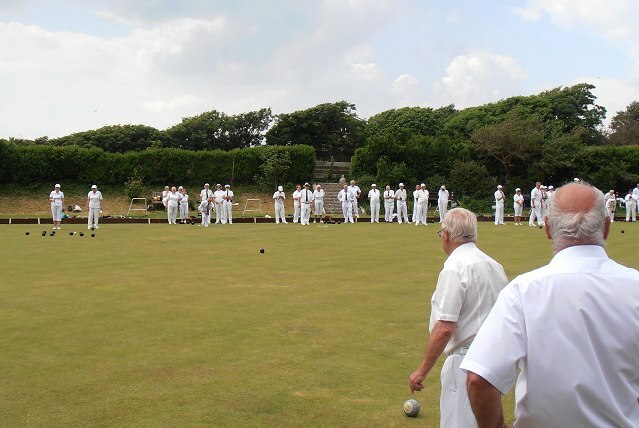 We set off for Combe Martin in the early afternoon and arrived just as the rain stopped. By the time we had changed it was bright and breezy and the sun was even threatening to come out. Combe Martin were very friendly and really keen. When “threes up” was announced it became obvious that they were not taking us lightly, evidence of County involvement also pointed to the fact that we needed to be “on our game” if we were to push them hard. We lost but they didn’t have it all their own way as we competed well. At least it stayed dry and the sun did shine at times. 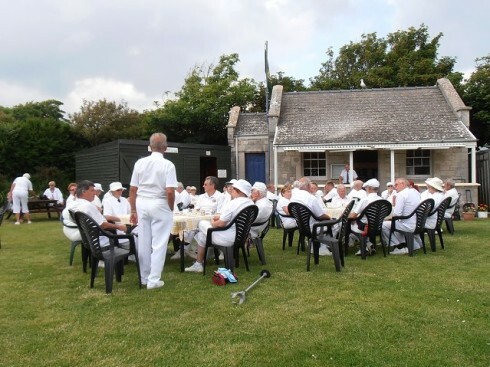 Then it was back to the hotel for another excellent evening meal and later a walk down to the nearby harbour for some of our party to see a spectacular fireworks display or refreshment at one of the hostelries which could be found in that area. Sunday morning again brought rain. 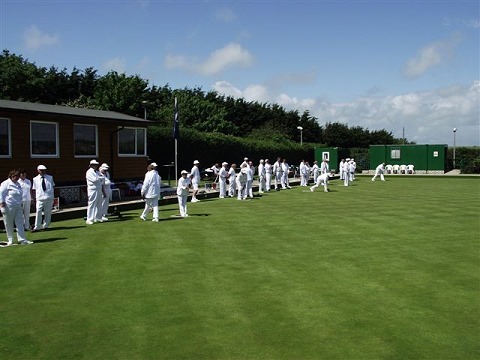 Mid morning we departed for Barnstaple for our match with Barnstaple United Services Bowls Club. 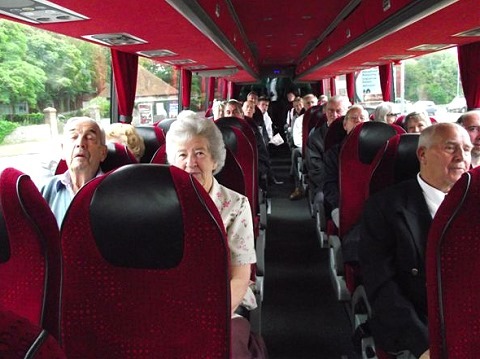 The coach dropped us off at Green Lanes Shopping Centre in Barnstaple to allow some Retail Therapy for a certain section of our party, by which time the rain had stopped and the sun was out which meant the non shoppers could at least sit outside and catch some rays. We were collected around 1-30pm and taken to the venue for that afternoon’s match. By this time the sky was blue and the sun hot so we were looking forward to the battle. The weather was so good a photograph was in order and duly taken as can be seen here. Again evidence of County involvement could be seen and Barnstaple although again very friendly were obviously keen to emerge victorious. Once again after a hard fought match Highworth lost despite our efforts and we returned sunburnt to the hotel for yet another good meal. 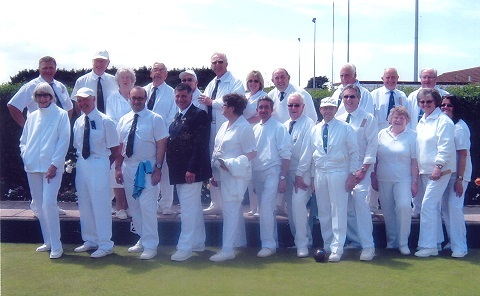 Monday the day of our return home started with warm sunshine and blue skies and our cases were packed and loaded on the coach ready for our journey home via Minehead where we were to play our final match. The previous morning great hilarity had occurred while we were sat waiting to leave by a broken bathroom window in the hotel opposite or more particularly by what could be seen through said window. Still broken on Monday it was again being checked out when Danny our coach driver announced that we could not leave as the computer was indicating a problem with the coach. 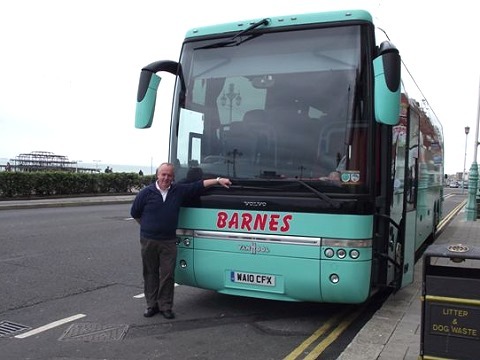 He contacted Barnes Coaches in Swindon who had a spare coach in Bude but this would not arrive in time to reach Minehead for our match so he was told to obtain a coach locally. This duly arrived, a school bus from Taw and Torridge Coaches to which we transferred with our bowls bags but with no room for our cases which stayed in Ilfracombe with our original coach. Even the problem with our coach failed to dampen our spirits as we were all having a great time as usual and our travelling in a School Bus caused much hilarity. 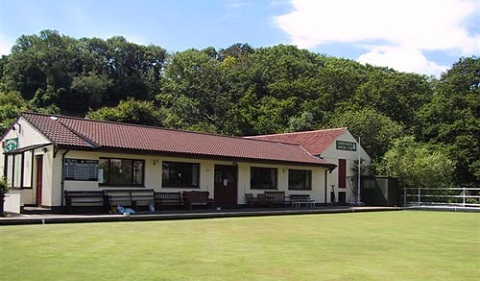 After yet another scenic coastal journey with superb views over to the Welsh coast and the ascent of Contisbury Hill and the descent of Porlock we arrived very early at Minehead Bowls Club who had been informed of our problem and had kindly arranged to open the club for us. 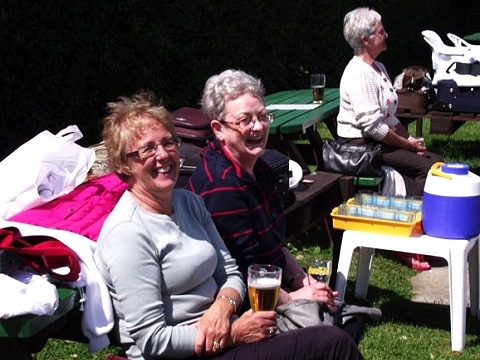 We were able to walk into the town for a quick lunch then returned to the club to sit in the warm sunshine. By 2-30 when the match started it had clouded over and the rain soon followed, but determined to end the tour on a high we donned our wets and emerged victorious. 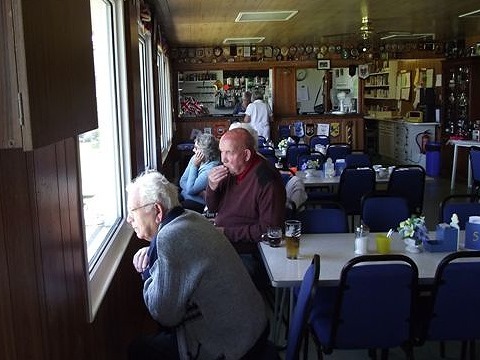 We adjourned to the clubhouse, and as we were still without a coach wondered if we should be investigating the availably of spare rooms with the Minehead membership! Fortunately this proved unnecessary as Danny and the coach drew up 30 minutes after the match had finished. 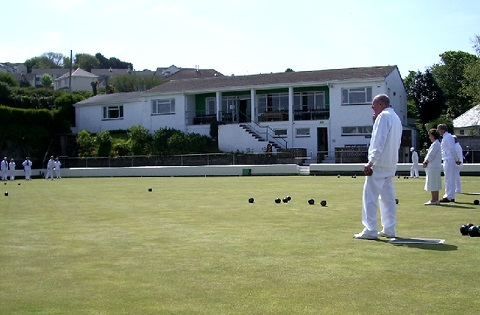 He had waited in Ilfracombe until a mechanic had arrived at 4pm. His diagnostic equipment identified a computer fault, so he reprogrammed the computer and 10 minutes later Danny had been able to set off for Minehead. 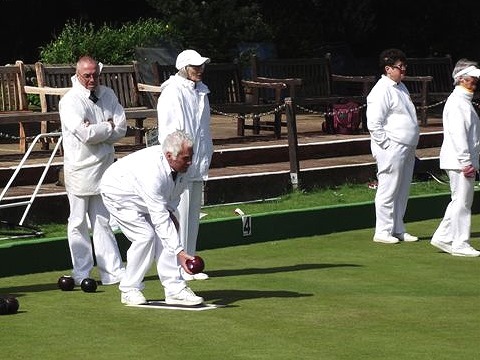 The journey home through murk and rain was uneventful and we pulled into Highworth Bowls Club soon after 8pm and another fantastic bowls tour came to an end. 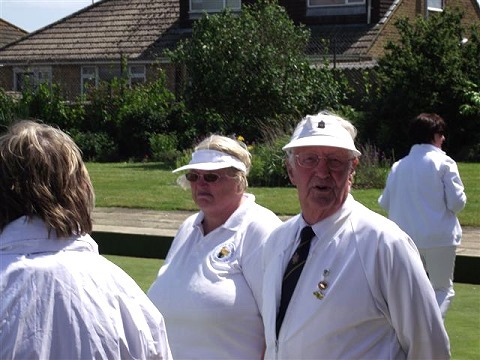 On behalf of all participants I extend our grateful thanks to Frank and Josie Etherington for organising not only this but the many previous bowls tours on our behalf which involve much hard work and dedication. To many members they are the highlight of their season and the organisation is second to none. 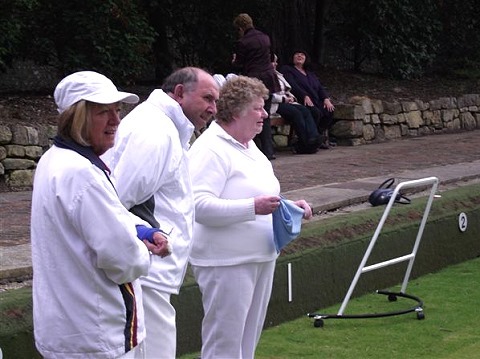 Frank and Josie are meticulous in ensuring that even with the odd problem such as a dodgy coach computer everyone has a great time and bowlers and non bowlers alike are catered for. 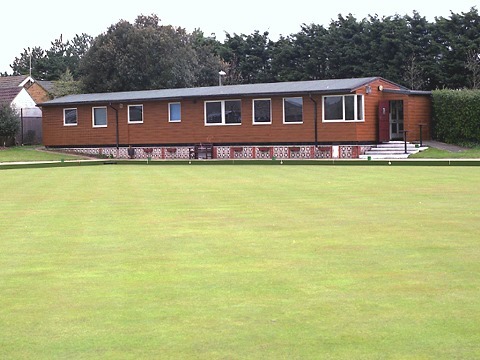 Their attention to detail means that everyone is treated as an individual and all of us appreciate everything they do to ensure that an enjoyable time is had by all.